Columbus Advanced Inspections recommends that aluminum wiring in the home be repaired due to the fire hazards that it may create. Contact our Columbus home inspectors to discuss these dangers and what improvements can be made to improve your home's wiring. Look for the word "aluminum" or the initials "AL" on the plastic wire jacket. 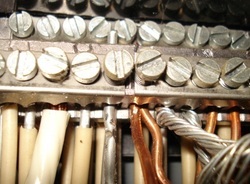 Where wiring is visible, such as in the attic or electrical panel, inspectors can look for printed or embossed letters on the plastic wire jacket. Aluminum wire may have the word "aluminum," or a specific brand name, such as "Kaiser Aluminum," marked on the wire jacket. Aluminum wiring can be a fire hazard due to inherent qualities of the metal. Columbus Advanced Inspections will inspect for the presence of aluminum wiring. Contact our home inspectors if you have questions regarding the dangers of aluminum wiring or any concerns regarding the wiring of your home.